The entire mount is comprised of two low-profile InVision lyres with a 20mm (0.78") clip at the front, and 9.5mm (0.37") rear clip. The lyres rest on a bar with a 3/8" threaded stand adapter at the base. 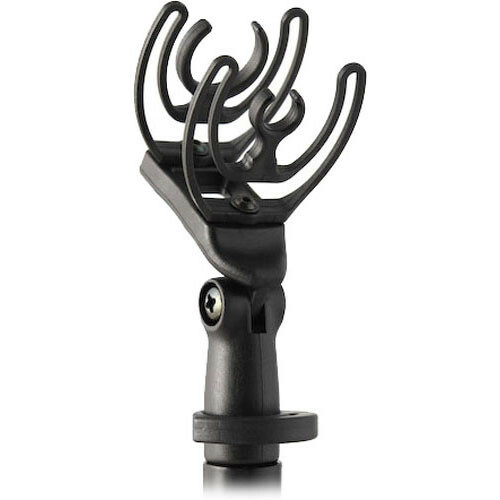 The InVision suspension system is available in various clip sizes to accommodate different microphones. The 20mm and 9.5mm mounting clips included with this system are intended for mounting remote cabled microphones such as the Rode NT6 and Sennheiser MKH8000. The small InVision lyre suspension webs measure 42mm high and 40mm wide. The small, low-profile design is ideal in broadcasts, recording applications, etc. The 20mm and 9.5mm mounting clips included with this system are intended for mounting remote cabled microphones such as the Rode NT6 and Sennheiser MKH8000. Box Dimensions (LxWxH) 7.0 x 4.25 x 1.9"